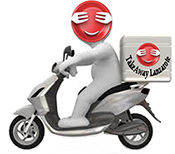 Pizza Playa Blanca - XXL Pizzas Delivery - XXL Pizza Takeaway - Burgers . Open : 12:00pm-02:00 am. Closed on Tuesday . Open Monday to Saturday from 10:00am to 22:00pm. Open Monday - Saturday : 12:00pm-00:00 am.